Announced long in advance, we’re now happy to unveil our new Online Shop! The new site offers improved navigation, extensive filter functions and a clear and well-ordered structure, optimized for all devices. Welcome to a further member of our fast-growing KLOTZ Family – Bas Maas, guitarist with DORO, is a pro musician who’s often on tour. His choice is the KLOTZ classic, the LaGrange Cable. Meanwhile Broadcast Asia became an annual tradition for us. It´t THE leading trade fair in terms of networking, knowledge transfer and purchase. This year we will show our latest developements from the fields of fiber optic, mobile CAT solutions and multicore systems. Our new XLR Connector, manufactured in-house, has had unanimously positive feedback since its launch. Colour-coded rings provide a fresh new look and create order at the mixing desk. Data highways have never been more crowded. In response, we designed our new Fiberflex Ultra F8UM11 8x FO cable to cater to these new demands. Its eight cores transmit up to 10 GB/s each. KLOTZ helps you get fit for the digital future! As announced, our new B2B Online Shop went online on May 17th, 2016. Our previous online shop will be deleted, together with your login data. The addresses and conditions of already registered and existing business customers have already been transferred from the old webshop to the new shop. You are already registered with us under your stored email address. If you no longer wish to be a customer, send an email to info@klotz-ais.com and we will deactivate your customer account. In the new Online Shop, you’ll be able to find the products you want far more quickly. And it also offers improved navigation, sophisticated filters and search functions, a clear layout and cutting-edge usability for all your devices. Sometimes things in life seem to fit together perfectly – they just gel. That’s what happened to Bas Maas, guitarist with DORO. An older friend showed him what to do with the six strings … and Bas started playing on stage at the age of 16, with a repertoire of classic rock songs. He joined symphonic rockers After Forever while he was still a student. The band split in early 2009, but it wasn’t long before Bas was contacted by Doro Pesch. Since that time he’s toured non-stop with the German queen of metal. It’s a life that presents enormous challenges for the equipment he uses. So it was only logical that Bas would choose the ultimate KLOTZ cable: the legendary LaGrange. It’s been a successful year to participate in Broadcast Asia 2016 held at the world famous Marina Bay Sands Expo Convention Centre in Singapore. The response is good as new contacts have been attained over this few days. Besides the interest to the new KLOTZ CatLink adapters, the demand for our fiber optic and video cable solutions for broadcast applications has been overwhelming. 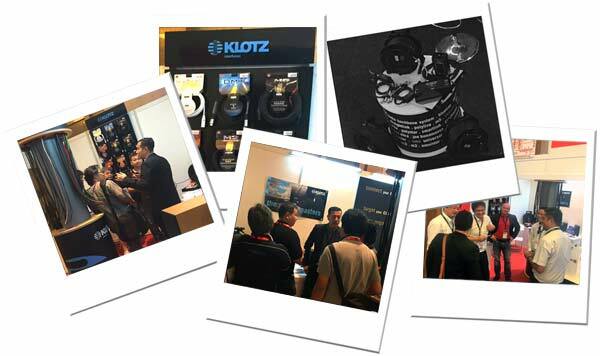 Thanks to all who visited us at KLOTZ booth 4D7-01, Hall Roselle. Given this, the next stage was only logical: in future, KLOTZ cables in the GREYHOUND, M1, M2 series as well as our AES3K AES/EBU cables and our DMX5K DMX cable will also be made up with our own XLR connectors. The plastic sleeve with ergonomic recessed grip is crafted from ultra-durable two-component material. The distance ring between the sleeve and connector is ribbed for flexibility and ‘give’, enabling cables of any diameter to be made up with the right torque for a perfect fit. KLOTZ XLR COLOR connectors - colour up your slot! Since market launch we received positive feedback throughout for our new in-house manufactured XLR connectors! They will be available soon with coloured coding rings! The connectors add a bright pop of colour to often sadly monochrome mixing desks, as well as boosting clarity and order. The ever-growing volume of traffic on data superhighways also impacts on mobile environments. In response, we designed our new FiberFlex Ultra F8UM11 8x FO cable to cope with these new demands. Developed for maximum flexibility with 500 μm primary coating and 900 µm tight buffered fiber layers, the cable protects the fibers (8 x 50/125 µm, OM3, multimode) from external influences while also keeping bending radius to a minimum. The ultra-rugged PUR outer jacket has a diameter of only 6.4 mm and can handle the rigors of outdoor operation; winding and drum storage are child’s play even at the most extreme temperatures. The FiberFlex Ultra is made up with our innovative SmartBeam expanded beam connectors, offering rock-solid connections that comply with the IP 67 rating. They’re even impervious to harsh climatic conditions and dirt. To ensure the cable offers data throughput to match, we used the new-generation SmartBeam Octo with eight (!) lenses to make up the FiberFlex Ultra. This enables transfer rates of 8x10 Gb/s to be reached – ideal for connecting complex networked systems for outside broadcast units or for linking mobile studios. A single cable can handle multiple MADI and HD-SDI or a gigabit network!